In Acts 2:1-13, Jesus’ disciples receive the much anticipated and long-awaited promise of the Holy Spirit on the day of Pentecost. Here we see the Holy Spirit is new power, that brings a new message and forms a new people. This is instructive for us as a newly forming, Jesus-loving, Spirit-filled people in the city. 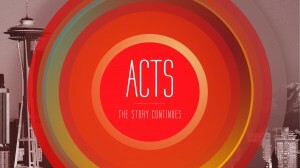 We are on the front end of a brand new series through the book of Acts. The book of Acts is part of a two-volume set, along with the Gospel of Luke, written by Luke the physician. While Luke’s Gospel is about what Jesus began to do and teach while on earth (Acts 1:1), the book of Acts is about what Jesus continued to do from heaven, through his people, by the Holy Spirit. Acts has a simple and single big idea: what happened after the life, death, resurrection and ascension of Jesus the Christ. Today, we’re going to look at the outpouring of the Holy Spirit on the day of Pentecost (2:1-13). As you may be aware, the person, work and gifts of the Holy Spirit can be confusing and controversial. This is unfortunate since the Spirit is one of the distinguishing features of the Christian faith. Unlike other religions, following Jesus is much more than merely aligning your life with a doctrinal statement or list of beliefs. Rather, following Jesus means being indwelt by the Holy Spirit. This is amazing news! God does not merely want to dwell on or among us, but in us. While this passage receives a lot of attention for its Holy Spirit-inspired phenomena, it is easy to miss Luke’s intent. Luke wants to explain how a small group of uneducated men and women from a marginal class, marginal people group, living in a marginal region of the Roman empire went on to define the empire. There are clear ramifications for us as a newly forming people, following Jesus, here in the heart of our great city. Q: When does the “baptism” of the Holy Spirit occur? This is a debated, and often confusing, issue. Pentecostals/Charismatics will point out that the 120 were Christians prior to Pentecost, when they received the Spirit. They argue this is he normal way Spirit operates: conversion and then the “baptism” of the Holy Spirit later. But, if we look at 2:38 Peter seems to be saying that belief and reception of the Holy Spirit happen at the same time. What do we make of this? We believe that the experience of the original 120 disciples on the day of Pentecost is the exception, not the norm. The normal mode is highlighted in 1 Cor 12:13 “For in one Spirit we were all baptized into one body” (context = conversion). In other words, upon conversion you get all of the Holy Spirit. The issue then becomes does Holy Spirit have all of you. So, to be clear. Some teach you need to pray/seek God for the baptism of Holy Spirit after conversion. We don’t believe that. We believe there is one baptism of the Holy Spirit at conversion for all followers, but there are many fillings of the Holy Spirit as we yield our lives to him again and again. You can believe differently on these issues and still be a part of Downtown Cornerstone as long as you don’t create division and disunity. On the major issues we have conviction, on minor issues we aim for tolerance, and in all things love. Q: What is the gift of tongues (glossolalia)? This is an Interesting study that I encourage you to embark on more fully on your own. Here, in Acts 2 the gift of tongues is a known language that requires no interpretation. But, in 1 Cor 14 the gift of tongues is described as a personal prayer language. Some will say that this prayer language is for all believers, but we say its for those to whom God chooses to give it per 1 Cor 12:11 “[Spirit] apportions to each one individually as he wills.” Some will also say this prayer language is needed proof you have the Holy Spirit, but Bible doesn’t teach that. It is a proof, but not the proof. The Holy Spirit is a NEW POWER. (Acts 1:4,8; Luke 24:29) When we hear “power” we think of getting a supernatural zap. But, being filled w/ the Holy Spirit is not like receiving an electrical shock. Rather, it is God making truth about himself come alive. Or, in other words, being filled w/ the Spirit is experiencing the truth of God. Ex. Disciples believed same thing prior to Pentecost, but the Spirit lights the truth of God on fire and makes it real to their heart. Quenching or Grieving the Spirit (1 Thess 5:16, Eph 4:30). Your experience will be in proportion to your submission and yielding of your life to him. This power is why everything changes after chapter two. The simple, uneducated fisherman Peter becomes courageous. Stephen becomes the first martyr of the church, prays for those killing him while in the act. Apostles are no longer timid, confused, but bold and inspired declaring the gospel. Q: Are you experiencing the power of the Holy Spirit in your life? Unless there’s an experience of reality of God – or at least a desire and struggle for it – there is no Spirit. There was a diverse, international, multi-lingual crowd that came to see the 120 believers. The “tongues” (or languages) allowed the disciples to proclaim the mighty works of God to the “world” in their own language. God’s blessing to Abraham “be a blessing to the world” is unfolding before us here. This event symbolized a new unity in the Spirit that goes beyond racial, national and linguistic barriers. Gen 11. Tower of Babel. Men came together to “make a name for themselves”, proudly ascend to heaven. So, God gave them all different languages. Eventually, what emerged was nationalism, racism and elitism. Pentecost is a deliberate and dramatic reversal of the curse of Babel. At Babel languages were confused and nations were scattered. At Jerusalem, language barrier supernaturally overcome as sign that nations would be gathered together. At Babel, the nations tried to proudly ascend to heaven. At Jerusalem heaven humbly descended to earth. The Spirit descended to bring all the nations together in Christ. Breaking down racism, nationalism, elitism. In Christ, the most important thing about you becomes the cross – everything else is secondary. In Christ, you’ve more in common w/ people of other cultures than someone of own that doesn’t believe. A major evidence that the Spirit is at work among a people is that they get along with people they would never get along with anywhere else. The Holy Spirit is a NEW POWER > Making the truth of God real to the heart. The Holy Spirit brings a NEW MESSAGE > Hope in God’s mighty works, not ours. The Holy Spirit forms a NEW PEOPLE > Multinational, multilingual, multiethnic people brought together in Christ. The Christian’s life in all its aspects – intellectual and ethical, devotional and relational, upsurging in worship and outgoing in witness – is supernatural; only the Spirit can initiate and sustain it. So apart from him, not only will there be no lively believers and no lively congregations, there will be no believers and no congregations at all. I pray not so much for graces as for the Spirit himself, because I feel his absence, and act by my own spirit in everything. Give me not weak desires but the power of his presence, for this is the surest way to have all his graces, and when I have the seal I have the impression also; He can heal, help, quicken, humble suddenly and easily, can work grace and life effectually, and being eternal he can give grace eternally. Save me from great hindrances, from being content with a little measure of the Spirit, from thinking you will not give me more. When I feel my lack of him, light up life and faith, for when I lose you I am either in the dark and cannot see you, or Satan and my natural abilities content me with a little light, so that I seek no further fro the Spirit of life. Teach me then what to do. Should I merely humble myself and not stir up my heart? Should I meditate and use all means to bring him near, not being contented by one means, but trust him to give me a blessing by the use of all, depending only upon, and waiting always for, your light, by use of means? Is it a duty or an error to pray and look for the fullness of the Spirit in me? Am I mistaken in feeling I am empty of the Spirit because I do not sense his presence within, when all the time I am most empty and could be more full by faith in Christ? Was the fullness of the Spirit in the apostles chiefly a power, giving the subsistence outside themselves in Christ, in whom was their life and joy? Teach me to find and know fullness of Spirit only in Jesus. Amen.